“Doomsday Two” began at the end of school one day when Mr. J.B. Smith’s baritone crackled over the school’s antiquated public-address system, “Teachers! Make sure your students tell their parents that all students will be receiving smallpox vaccinations this week”. So, that day, the teachers dispatched a group of first-graders with a message to take home to their parents; “the school will be giving all students smallpox this week”. Tragically, they left out the word “vaccine”! So, as I carried the principal’s apocalyptic message home to my parents, that old feeling of “impending doom” bore insidiously down upon me. “The school is giving the children smallpox this week. Surely death and destruction will be poured out upon us like the biblical plagues that God rained down upon the Egyptians during the epic ‘Exodus’ of the Israelites. It will be poured upon us like the contents of the bowl poured upon the land by the first angel, causing, “ugly, festering sores to break out on the people who had the mark of the beast and worshiped its image’ as recorded in the fiery files of the book of Revelation.” These words—or words like these—were on the twitching tongues of every adult mouth on South Street. Meanwhile, my spirit was being slowly crushed by the weight of the impending advent of my own imagined, “Doomsday”. That awful day arrived much too soon. 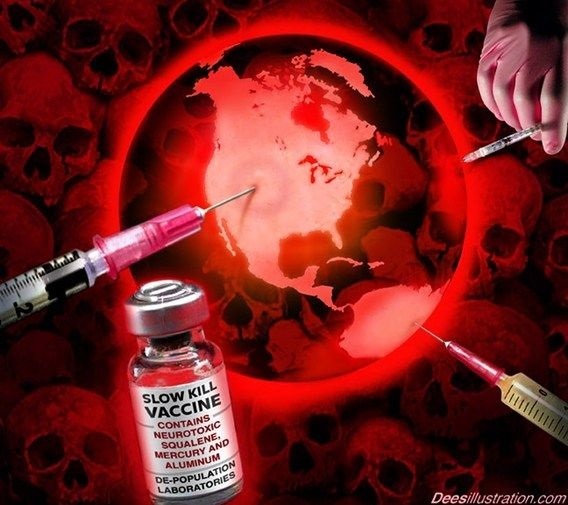 First-graders were herded towards “The Vaccination”, like so many sheep being led to slaughter. No “lambs” bleated. Like sheep before its shearers, we spoke not. We laughed not. It was a “silence of the lambs”. There were sniffles, as some of us cried silently. We were led down a hallway where a large White man in a white lab coat hovered. In his hand was something out of a science fiction movie. In his hand, he held a gun. “Maybe it’s some type of ‘ray gun” my childish mind mused. One by one, he placed the gun against our bared left shoulders and pulled the trigger. “Pissshhhh!” the gun hissed, as it injected a clear liquid from the bottle attached to the top of it. Surely now we would all be led to the grassy field below and allowed to lie down and die in the relative comfort of the grass. At least our last breaths would be filled with the pleasant and reassuring aromas of the lush, green vegetation that grew there. At least, before death sealed our eyes forever, we could watch the black silhouettes of the crows as they floated across the blue and white sky. But, no-one died! Later, I would learn that we had been “inoculated” against the ravaging and ravenously deadly disease known as smallpox. According to Leart Shaka (2011), “Smallpox is credited with being the deadliest disease to ever have befallen human kind; it killed over 500 million people, more than any other disease has, and more than all the wars of the twentieth century combined. When the European settlers brought it over in North America, it decimated the native inhabitants. Their population plunged from 70,000,000 to a little over 600,000 due to death by disease and warfare. No disease was ever more destructive than smallpox.” It has even been postulated that smallpox was one of the reasons that the Spaniards were able to conquer the Aztecs and the Incas; after all, the Spaniards were severely outnumbered and should have been easily defeated despite their more advanced weaponry. In the 20th century, smallpox killed some 300 million people globally. However, the good news is that, thanks to the work of a British man named Dr. Edward Jenner, who used fluid from a blister of a cow infected with the cowpox virus to develop a smallpox vaccine and the efforts of the World Health Organization (WHO), smallpox was eradicated by 1980. It is estimated that Dr. Jenner’s work saved more lives than the work of any other human in history. He has been, arguably called, “the most important man in history”. I once heard a young person ask this question, “How come old people have a circle on their upper arm?” The circle on the upper arm or shoulder of some of us, “old people” is a “badge of courage”. It is the mark left by the “gun” that fired a life-saving vaccine into our bodies, thereby leading to the eradication of the deadliest disease to ever be visited upon mankind. The apprehension and outright fear the, “old people” and their parents faced during “Doomsday Two”, made it possible for our progenitors to live in a world free of smallpox, mysterious men in white coats, “ray guns”, and more. You’re welcome.